I just realized it has been over 6 months since I posted. Last year I unfriended soooo many people on Facebook-because I was having a colossal shift in my world view. I needed the freedom to say what I was thinking and feeling with out offending or receiving judgement. Looks like I was hiding my light. So very thankful that I went back to SECCOC with my sister and her family a few weeks ago. I have had a love/hate relationship with the church for decades. In my 20’s, I had friends who were hurt deeply by this church. In my 30’s I was a member of a church that was jealous of the success (I can’t even talk about how wrong this is) of Southeast. I started going to the OC campus 2 years ago-I needed a worship experience like I get when I am in Nashville at Crosspoint. (As much as this sounds like I want to be entertained- that isn’t it). Of course he was right and I needed to hear it. That series was called The Outsiders. Basically, confirming my long held belief that it doesn’t matter WHAT the government or society does as people of God and followers of Christ, it is OUR job to speak truth in love AND LOVE. That series stirred something in my heart. And now we are tackling isms. 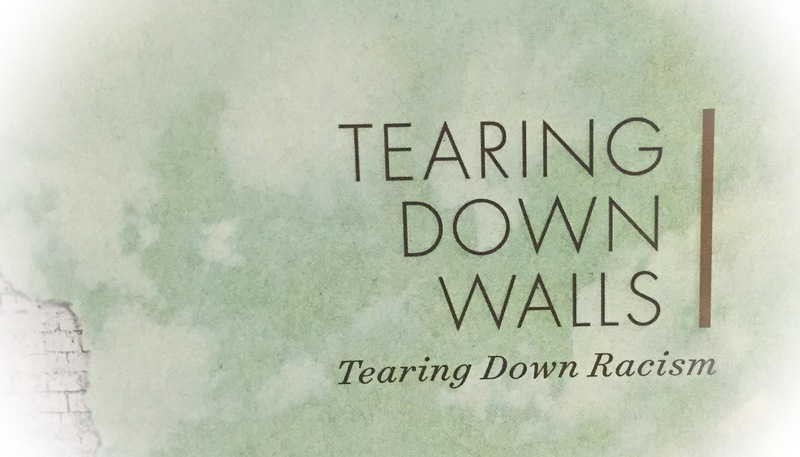 Tearing Down Walls is what it is called and today was on Racism. Way back up at the top I said I unfriended LOADS of people. I didn’t want the confrontation. I didn’t want want to be bold and uphold what is holy. I don’t need to be loved. I need to do what Jesus needs done. I made it almost 24 days in a row until the world spun out of control. Nothing life altering happened, but several small family emergencies took precedence last week. I didn’t post here, I didn’t work on another project. I kept up with my day job at a bare minimum. Over the weekend I worked my first craft/art show since the man child was 7 or 8. I quit when he started playing soccer-that occupied all of our free time for the next 10 years. I loved it, I used that time to develop photography skills instead of creating polymer clay items for sale. But I missed that level of creating. I didn’t miss clay so much because it is a plastic polymer and I wasn’t willing to cure it in the same oven we ate dinner out of. I had to let it go. It was hard because I was good at what I created. I never realized HOW good, until this weekend. Granted Friday night was slow until around 7:30 PM and people were there to eat more than shop, but I did see people buying, the lady next to us sold a crapton of her repurposed coffee bags. Saturday it started raining at 11:30. Not a little misty sprinkle that had been going on since we got there at 9. No this rain, was a street flooding, our boxes are getting soaked standing water rain. We cut and ran. I looked at the forecast, I knew it was going to rain like that for at least 2 hours. And there was potential for severe weather. I have a full time job and that wasn’t it. I couldn’t afford to take a few days off this week to recover if I got a cold from sitting in that weather. My friend and I also decided that we weren’t going to do outdoor shows again…not cut out for it. When you do a show inside, you don’t really have to depend on the weather…if it is raining out, people will COME INSIDE TO SHOP…same with if it is cold…the only thing where this matters if it is snowing 3 feet. I don’t know…I suppose people who do that as a full time job have paid for insurance to cover the cost of lost and damaged items from keeping their booth open-I don’t. I suppose her fear was that she would not be asked back to the show. From my experience of not one sale, that won’t hurt me so bad-right now my friend and I are out over $300 preparing for an outdoor show…not to mention all the money I spent on the food trucks. I don’t know if it is that I am not cut out for doing shows outside or if I am just too old. DISCLAIMER: DO NOT CLICK ON THE INSTAGRAM TO SEE THE CUTE. I didn’t write yesterday. I didn’t mean for the day to get away from me, but it did. Part of it was TGIF! I am not sure why this week was so tiring, but all I wanted to do was watch Mad Men with the spouselet until I couldn’t see straight. We were moving along quite nicely on that plan with the 20 year old came home at midnight and asked me to come to the downstairs bathroom, ne needed to show me something. I knew what it was going to be before I got out of my bedroom. Something that was going to need A LOT of care. Something I did not want to deal with. And then he opened the door, and in a big cardboard box lined with a pink fluffy blanket where the four smallest (non-weaned) kittens. Not that I have ever seen because when he was about 9 there were kittens under our house. (Another story, for another day). He and his girlfriend had researched. They knew that these little babies probably still needed to have help with learning to eliminate waste. (I am not describing it here, go look it up if you don’t know). They need to be fed every FOUR HOURS with a bottle. They have already found homes for 3 of them and he swears he is keeping the little white one. They are taking them to a vet today to get checked out. I am concerned that they are not healthy. Mama cats don’t leave babies unless they are sick or she is dead. Either way, they were wild cats, milling about on the side of the road (that is how they found them). Oh and I am allergic. I always try to pretend that my inability to breathe after handling a cat has NOTHING to do with then and everything to do with some other histamine force in nature. So, being impaired by cat dander didn’t stop me from picking them up and holding them…getting their allergy funk ALL OVER ME (and my shirt). I did wash my hands after dealing with them, but I slept in the shirt they were all lovey on. I woke up with a sore throat and itchy eyes. I told the kids they can’t stay at our house, those precious babies were perfect snack size for two 55 pound dogs. Those kittens are smaller and slower than squirrels that my dogs “played with” until they stopped moving. And I have a plan. An animal reduction plan. My dogs are 11 and 13. Winding down their time on this rock. Scooting toward the rainbow bridge. I do not want to start this cycle over with a cat (that could live to be 20). This morning, first thing, the girlfriend was back at my house with a box lined with a pink fluffy blanket and four kittens. Her family won’t let them stay at their house either. They are NOT staying with me. I saw a quote this morning that reminded me of one of my old design instructors. She was an instructor and freelance designer and she was one of the most inspiring instructors. She has an impressive portfolio including being a designer for the Kentucky Governor’s mansion. I have not seen her in almost 20 years but, think of her often. Most of the time, when I see bad or super trendy design. She is the reason that I cannot look through an issue of HGTV and have gone back to House Beautiful and Architectural Digest. She is the reason I have watched Everything But the House for months on end bidding on Walnut, Drop Leaf Tables. She is also the reason I begged my mother for her Century Furniture Chinese lacquer and inlaid desk (with matching chair) when my mom was re-doing her living room. Designer Justine Cushing has held on to the same uptown Manhattan apartment for decades, and it’s never warranted a reinvention, only an occasional refresh, why? She got it right the first time. I cannot tell you how many times Sylvia would say the same thing to us. She would tell us how much people SHOULD spend on their home furnishings (a certain percentage of the cost of their home) and as 19 and 20 year old women we would gasp. And she would smile and say, if you do it right the first time, they won’t need to do it again. If you take shortcuts and do it the quick way or load your house up with Ikea, it will work for THAT point in time, but it won’t be there for your children and grandchildren. She always said buy heirloom pieces to pass on to your children. Sometimes I test her statement by picking up old issues of ID or another high end interior design magazine and browse the pages. More often than not, the issues are dated by the technology or photography, not the principles and theories of design. I also see proof of her powerful statement when I go into some estate sales of homes that have not been updated in decades (the condition of the carpeting and need of fresh paint) yet, people are carrying out the homes furnishings by the truck load. This doesn’t happen every time, I have also been to sales where the furnishings were bought for the style of the time. Anyone remember wagon wheel furniture? The spouselet calls this person, the version of myself that has very strong opinions about Design and home furnishings his “Design Star”. It originated after we used to watch the HGTV show. I have opinions. I have an art/photography star. There is also the stationary star (the version of me that has a thing for pens and paper). I know there are more of them-every time I have a strong opinion, it gets dubbed a “star”. Today, you have met my Design Star. The Spouselet thinks she is about 8 years old, but she was born in 1989 sitting in Miss Sylvia’s class, learning how to do it right. 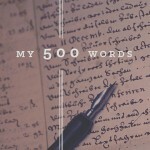 I am getting pretty excited, this is day 20 of 500 words a day. Some days I know I could have written more and some days it was really hard to knock out a post. Today, is a bit of another celebration post. For the past few months I have been working on a project for my “day” job. I have been creating a company book talking about what we offer, the areas we serve and what we do. The first round was so wordy that my Brother in law and I decided that we needed to cut the crap and get down to bare bones, if someone has questions about a service or program, this leaves the conversation open for them to talk to their sales associate. The management team had seen part of the first wordy version. They had no idea the radical changed that were made. That was what I had to present today. I learned Adobe InDesign for this project. I know a bit of Photoshop, I use Lightroom almost weekly so I thought “why the heck not”. Holy Hell that was a learning curve. But, it was so fun. It is one of the things that I love about my job-I can create a marketing piece or we can shop it out. 15 years ago, I did the company website, I loved learning HTML. I had to give over and hire a company when technology go to the point of incorporating live listing data. The only thing I regret about hiring a company-my programming knowledge has come to a screeching halt. Luckily for me, there are apps and programs that will do most of what I need done these days on a personal level and when there isn’t (or I can’t afford it) in walks my awesome spouselet. Today was the big meeting. I printed copies of the almost compete book, there are still a few pages that need additional data and images. I had one for every manager and a “master” correction copy for them to make notes of what they needed updated (proofed) to pass around. Having the master prevented me from thumbing through 10 copies for changes. Besides, I wanted them to have it. They loved it. Outside of “can you change this word” or “add this program” there was nothing but love. Working for family can be hard. Working for family when you have other non-family principals can be even more interesting. This was a huge win on so many levels for me. I felt like Sally Field. I also realize that this post sounds like I am 20 years old instead of 46. Daddy approval is strong with this one. But as a creative. As an artist. The photography (ALL the photography minus corporate logos and two banner’s created with corporate stock photography) MINE. I did have input and guidance from a few people in the office, but this baby, for the most part, ALL MINE and it was well received. Man, I love outside validation. Oh and I lost another .4 lb. In the face of adversity and all of that..which is to really say, I am damned lazy and I want to go to bed but it is not even 6 pm. and THEN I remembered that I hadn’t written for today. I headed back to the basement and saw that my bar stool (that I use when I am DONE standing up design) was covered in boxes for a project. I was just going to use my Surface-until I realized that I left it at the office. then, out of the corner of my eye, I spotted my beautiful ole MacBook. Granted, it is about 6 years old and took about 15 minutes to fully boot AND about 10% battery power before I could type word one…it is humming along now. So many times in this process I wanted to give up and just go to bed. Hell, I don’t even have the energy to move this lawn chair so I can recline more while I type. I wish I had trained my dogs to open doors and use the water and ice dispenser on the refrigerator, because I am out of a drink too. I think I am dehydrated. Silver lining-I am sitting on the deck, in the shade of a maple tree typing and enjoying the sounds of the neighborhood with two precious (untrained) dogs hanging with me. I think they are wishing I would get up and get us all a drink of water judging by the length of their panting tongues. And the most rotten part about being this exhausted…I have the house to myself and I don’t have the energy to enjoy it. Wow. I am getting a little lax in writing. Not that I am actively avoiding it, I just have so many other things going on at the moment. And today, I didn’t plan well. The lack of planning almost wrecked the “500 words” for the day and my food plan. I got up and piddled around the house, killed a few weeds, pulled some more, watered some flower beds and then decided that I needed to wash the sheets and WHILE I was at it just take our super big king sized comforter (we don’t even have a king size bed) to a laundromat and wash it. THAT is so much cheaper than having it dry cleaned. See, we have this super big bed cover thing because my husband only likes ONE thing on the bed, if he could get away with it, he wouldn’t even have a sheet. I on the other hand want a sheet, a cotton blanket, my down comforter and if I am still chilly THEN a quilt. Layers create warmth. The plan was to drive there, wash and dry it in about 2 hours and then hit the grocery before a meeting I had with a friend for an upcoming craft show at 4. I didn’t take a computer, I took a book. I was going to have blissful quite time to read and journal and plan. What I ended up doing was listening to all the conversations around me. The day after the Kentucky Derby IS the day to hang in a laundromat for the stories alone. Oh my stars! I got back in my car at 3:30 and realized that I had not eaten. Not one blessed thing, I had an iced tea-but that was it. Fortunately for me I was about 2 minutes from Lucky’s Market and ran in really fast and got my Brussel sprouts I wanted for dinner and a few other things (primal beef jerky with pineapple) AND a little container of cheese and pepperoni. I ate the cheese and pepperoni on the way to my meeting. It would have been just as easy to hit a drive through and probably would have cost a third of what I spent, but I would have had a heart attack from all the grossness tomorrow. After my meeting about the craft show, we decided a quick trip to Michael’s for a few things was TOTALLY part of the planning process so away we went. I got home at 7pm and made my Brussel sprout and chicken dinner and started making journals for the craft show. I logged on to check something in email and realized that I had not typed word one today. SO, here are the 500+ words for Sunday. There is something about spring that get me going. I think it might be the sunshine. I live near Louisville, KY. It surprises people who don’t live here, but we have the same number of rainy/overcast days as Seattle. Winter is especially hard for me the older I get. When I was younger, I didn’t understand why people would want to winter in warmer climates. Back then I loved the dark and cold. Now, not so much. I always equated HOT with HUMID and I am was not a fan of humid. Turns out, I don’t mind humid if I am hydrated. When I hated heat and humidity, I drank loads of carbonated sugary beverages and smoked like a freight train. I was perpetually dehydrated. So, in reality, my dehydrated body hated being hot-How odd. (Seriously, some days I am amazed that I have made it to 46 years old without of extensive and comprehensive hospital stays). Honestly, I am a smart person. I have just had huge gaps in my body self-awareness. This morning, I am sitting at a local coffee shop with my husband planning the week, doing a little work and writing. We are sitting at the same table we grab every week (unless some uppity jerk gets here first). It near a window and the light is warming my hands as I type. Such beautiful sunshine. A few years ago, during the winter I was so depressed I could barely get out of bed. This was about the same time I found out that because I quit smoking I tossed my body into an insulin resistance fit of revolt. I was severely Vitamin D deficient-who knew that being a night out and actively avoiding sunshine could contribute to my health issues AND my depression. The doctor told me that I needed at least 5000 IU a day during the winter AND a UV Light to help with my mood. I got a Phillips GoLite the next week and now I have two “happy lights” one at the office and one at home. Starting in October-or near the time change, until the time changes again, I up my dose of D and pull out the lights. During the spring and summer I cut my Vitamin D to around 2000 IU. This past winter was the first time in several years that I didn’t sink to the pits of hell. It was sort of refreshing to be able to get out of bed every day without crying. I know that one day The Spouselet and I will move to somewhere with more light. That is one of my requirements for moving away from my home state. I will not have a lateral daylight move. When I lived in Phoenix, I used to track the days- I missed my overcast Kentucky. Once, there was over 150 days without rain. Typical in the desert but so hard for me to fathom back then. I would get sunshine manic. Now, I crave sunshine mania. Are you as sensitive to the light as I have become?